Spring cleaning in London is a service that our cleaning company offers at very competitive rates. We work with fully-trained and insured professional cleaners to assist you with your one off cleaning. 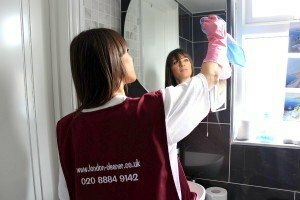 Cleaning bathrooms – toilets, sinks, mirrors, etc. Remember: If our spring cleaning service completely satisfied all your requirements you can book book domestic cleaners on a regular base. Check out our prices – click here. *Additional costs may apply. If you wish to have your home cleaned from top to bottom, all you have to do is phone us on 020 8884 9142 or e-mail us to book our professionals.